I love summertime. Like today, when I just spent the last hour freezing blueberries for this winter. 🙂 All these fresh fruits and veggies are just so awesome, and it’s a great feeling to know that your freezer is stuffed with summer’s bounty, in preparation for winter. Freezing Blueberries for your winter enjoyment. I poured all my blueberries into a large Tupper-Ware fix and mix bowl. I have a double sink with a garbage disposer on one side. The bowl was set in the garbage disposer side and filled it with water. The other sink was washed good and filled with water. The stems were pulled off the blueberries, and the stems and bad/mushy blueberries were dropped beside the bowl into the sink. The good berries were then tossed into the second sink. Once the bowl was empty, I moved to the second sink and double checked to make sure I got all the stems and rotten blueberries out. This time the blueberries are spread on a towel to dry for awhile. I use and recommend the Arrow Plastics freezer containers. (Affiliate link) They are sized and stack very nicely in your freezer and store great when you aren’t using them. If you don’t have freezer containers, you can use Ziploc bags, but make sure you get the freezer bags. However, if you plan on freezing a lot of stuff in the future, I definitely recommend that you invest in some nice freezer containers. They will quickly pay for themselves! When you fill your containers, make sure you leave some room for them expand as they freeze. Don’t forget to mark your containers with the date, and you can also mark the contents if you like. I use a piece of tape to write on, that way I don’t ruin my containers. By purchasing and freezing blueberries when they are on sale, I can save quite a lot by not needed to buy them in their off seasons. 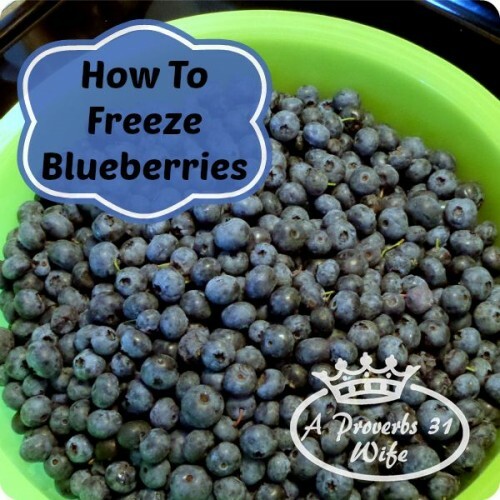 Do you plan on freezing blueberries? You may also like these posts on Freezing Cherries, and Freezing Strawberries. That is a GREAT idea! We received a FoodSaver as a wedding gift. It is so amazing! We started using that to put fresh fruit in to keep for winter as well. We also bought a huge bag of dry beans from Sams Club and used our crock pot to cook them. Then put those in FoodSaver bags as well to freeze. We make A LOT of crock pot soups in the winter and this will save SO much time! I love my food saver! We do our own meat, and vacuum seal all the meat. It lasts months longer that way! I picked my own blueberries at the farm down the street from me. Berries is something we haven’t tried to grow yet. I froze a bunch of them. Mostly because I wasn’t reading to make muffins yet. It was in the high 90’s and very humid the past couple of weeks. Love your blog by the way. Such a blessing to have found it. I am always looking for great ways to preserve food…thanks for sharing! This would be perfect to link up to my Create It Thursday post…it’s live now! Thanks Leslie, I will try and make it over there in a bit. I will give this a try. It’s time for picking here in Oregon. oh, we love blueberries and this wouLd definitely be worth is because to buy them frozen at the store is RIDICULOUS! I just put about 8 pounds of blueberries in my freezer. It was the first time I have ever froze them. Thanks for the advice. I will have to get some freezer containers for next time. I never thought of doing a second wash of the blueberries! I would love for you to share your project on my Meet Up Monday Blog Party! Thank you for sharing this! Do you wash them in vinegar before freezing them too? I’ve been told that keeps them fresher? I haven’t ever heard of that. I would think the vinegar would be more for removing surface pesticides than keeping them fresh, as they stay nice in the freezer just being water washed. G’day! Thanks for stopping by our #SayGdayParty! GREAT idea! Pinned! Thanks for sharing your tip at Foodie Friends Friday!